Ancient Surveying Surveyed & Lavishly Illustrated Galland, Pierre, & Adrien Turnèbe, eds. De agrorum conditionibus, & constitutionibus limitum, Siculi Flacci lib. I. Iulii Frontini lib. I. Aggeni Urbici lib. II. Hygeni Gromatici lib. II. Variorum auctorum ordines finitionum. De iugeribus metiundis. Finium regundorum. Lex mamilia. Coloniarum pop. Romani descriptio. Terminorum inscriptiones & formae. De generibus lineamentorum. De mensuris & ponderibus. Parisiis: Apud Adr. Turnebum typographum regium, 1554. 4to (22.3 cm, 8.75"). , 256, , 20 pp. ; 1 plt., illus.  Heavily illustrated first edition of various ancient surveying texts taken from a manuscript that editors Galland and Turnèbe found in the monastery library of Saint-Bertin at Saint-Omer. The Latin text, which incorporates occasional Greek quotations and symbols, is neatly printed in single columns using a larger roman type with woodcut decorative initials, a headpiece with grotesques, and 134 woodcut illustrations and diagrams, two repeated, in addition to thirteen full-page woodcuts of land measurement and nine pages of recording survey symbols. A section titled “Veteris cuiusdam auctoris de generibus lineamentorum” with separate pagination appears following a sizable index and one-page errata. This copy has the plate Mortimer describes as a pasted extension bound in preceding the applicable leaf (R4r). Binding: Elegant 19th-century dark green morocco Jansenist style, spine lettered in gilt with raised bands, board edges rolled in gilt with a dash and swirl design, turn-ins with arabesque and double fillet roll in gilt; French curl marbled endpapers, all edges gilt over marbling, rainbow ribbon placemarker still present. Signed on front bottom turn-in by Parisian bookbinder M. Lortic. Provenance: Bookplate of collector Olin Lake Merriam on front pastedown with ink signature dated 1903 and “+2" on title-page; institutional embossed stamp of the Horticultural Society of New York, also dated 1903, on one text leaf. Most recently in the library of American collector Albert A. Howard, small booklabel (“AHA”) at rear. Gay's Witty Creatures — Blake's Illustrations Gay, John; William Blake, illus. Fables by John Gay, with a life of the author, and embellished with a plate to each fable. London: Printed by Darton & Harvey, 1793. 8vo (22.3 cm, 8.75"). xvi, 256 pp. ; 35 plts. (incl. frontis. and engr. t.-p.). “But Make Haste to Newgate” Gay, John. The beggar's opera. 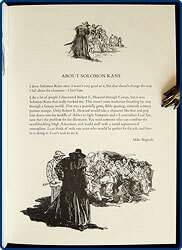 London: Daniel O'Connor (London: Charles Whittingham and Griggs, Chiswick Press), 1922. 4to (29 cm; 11") ; xxxiv, viii, 99 pp.,  leaves of plates, ill., facsims., ports.  One of 1000 copies: This one is not numbered. Edited and with an introduction by Oswald Doughty, “with 28 plates in collotype and a facsimile title of the first edition,” this was printed at the Chiswick Press with its title-page in black and red and using a type evoking the style of English books of the early 18th century. Includes bibliographical references (pp. xxxiii–xxxiv) and bears illustrated endpapers. Binding: Publisher's quarter white linen with blue-green paper sides, printed paper label on spine; the variant binding without the embossed medallion on the front cover and bearing instead a paper label that gives full publication details and describes the book as in “imperial 8vo” costing “two guineas net.” Top edge gilt, others deckle. 18th-Century London, Illustrated — Chiswick Press Gay, John. Trivia: Or, the art of walking the streets of London. London: Daniel O'Connor, 1922. (28.3 cm, 11.2"). xxiv, 90,  pp. ; 16 plts.  First trade edition: An evocative reprinting of Gay's mock-heroic verse description of London, with an introduction and notes by W.H. Williams. Printed at the Chiswick Press, the text reproduces the spelling, punctuation, and appearance of the 1716 first edition — with the exception of long S's, absent here for the modern reader's convenience — and is illustrated with 16 views of London by Hogarth and others. “Dark, Roiling Visions” — Howard's Bran Mak Morn Gianni, Gary, illus. 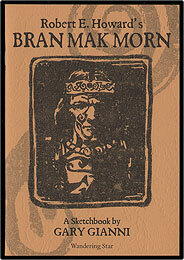 Robert E. Howard's Bran Mak Morn. London: Wandering Star, 2000. 12mo (21 cm, 8.25"). pp. ; illus.  Gianni's black-and-white sketches and designs for a deluxe illustrated edition of Robert E. Howard's Bran Mak Morn, opening with an introduction by Al Williamson and featuring excerpts from Howard's text. An uncommon pre-publication advertising item. 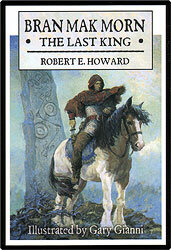 Postcard of “The Last King” — Howard's Tale Promised/PROMOTED Gianni, Gary, illus. Robert E. Howard's Bran Mak Morn. London: Wandering Star, 2000. 10.2 cm, 4". f.
 Promotional color-printed postcard featuring one of Gianni's designs for a deluxe illustrated edition of Robert E. Howard's Bran Mak Morn. An uncommon pre-publication ephemeral item. Neil Gaiman Thought THIS Art Perfectly Matched Howard's Vision Gianni, Gary, illus. 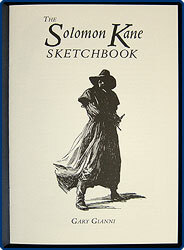 The Solomon Kane sketchbook. London: Wandering Star, . 8vo (21 cm, 8.25"). pp. ; illus. 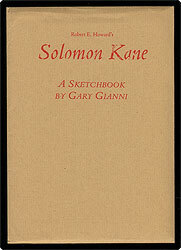  Gianni's black-and-white sketches and designs for a deluxe illustrated edition of Robert E. Howard's The Savage Tales of Solomon Kane, opening with introductions by Neil Gaiman and Mike Mignola and featuring excerpts from Howard's text. Pre-publication advertising ephemera at its best. A Pioneer of Russian Realism Gogol, Nikolai. The overcoat. The government inspector. Westport, CT: Printed for the members of the Limited Editions Club, 1976. 8vo (27.2 cm, 10.75"). xiii, , 187,  pp. ; illus.  Classic Russian literature in a Limited Editions Club version translated by Constance Garnett, with an introduction by Alfred Kazin and nine color engravings hand-pulled by artist Saul Fields, who used a hardened-collage technique of his own design. The volume was designed by Charles Skaggs and printed by the Meriden Gravure Co. in linotype Janson on cream-toned rag paper; the binding is green and brown buckram stamped in aluminum foil, done by the Tapley-Rutter Co. This is numbered copy 801 of 2000 printed, signed at the colophon by the artist. The appropriate Club newsletter is laid in. “In the Shadows behind the Alcázar” Gohorry, John. An incident in the Plaza del Zocodover, Toledo, 1584. [Tuscaloosa, AL]: Bullnettle Press, 1989. 8vo (25.4 cm, 10"). pp. ; illus. 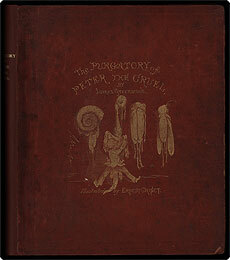  First edition: Gohorry's poem about a dramatic incident outside the Portingale embassy, with illustrations by Peter Lisieski (who had also previously worked with the Bullnettle Press on Parke's Advice to a Would-Be Author) — two large and one small drawing, each touched with color. Asa Peavy designed and printed the book in Spectrum type on Rives Heavyweight White paper, using a Vandercook 219 press for the poem itself and a Vandercook SP 20 press for the rest of the volume. This is numbered copy 80 out of just 100 printed. LEC: Sacred Text with Expressionist Art – Signed Goldin, Judah, trans. ; Ben-Zion, illus. The living Talmud: The wisdom of the Fathers and its classical commentaries. New York: Limited Editions Club, 1960. 4to (32 cm, 12.625"). xxxi, , 165,  pp. ; 12 plts.  Designed by Joseph Blumenthal and printed at the Spiral Press, this Limited Editions Club presentation offers the challenging book of Jewish law and tradition with commentary. This attractive volume contains Hebrew text hand-set in Hadassah type and printed in red, in addition to the English translation by Judah Goldin, who also edited and introduced the edition, set in black Poliphilus and Bembo types. Expressionist artist Ben-Zion provided 12 sepia-ink drawings (eleven full-page, and one double-spread) illustrating parts of the Talmudic text printed on a tissue guard before each drawing; these poignant works contrast the expansive, sacred text with their mono-color simplicity. This is numbered copy 1002 of 1500 printed, signed by the artist at the colophon. The monthly newsletter and prospectus are laid in. Binding: Quarter natural-grain goatskin vellum with black buckram sides and gilt lettering to spine; top edge is gilt. Presentation Copy  Bound by HAYDAY Goldsmith, Oliver. The vicar of Wakefield. London: John Van Voorst, 1843. 8vo (8.25"; 21 cm). xv, 306 pp.  A presentation copy signed by the publisher, “Dr. W. Cooke Taylor / from John Van Voorst,” on the half-title. This is likely addressed to William Cooke Taylor, the Irish journalist and historian who wrote extensively for the AntiCorn Law League. There are 32 illustrations provided by William Mulready, “the most distinguished talent of British Art applicable to this purpose . . .” (p. v). Binding: Bound by Hayday in green pebbled morocco, spine with raised bands; two compartments with title and author and four with rich and elaborate gilt decoration; wide gilt composite borders to boards, board edges with gilt hatching, gilt zig-zag design on turn-ins. All edges gilt. With a Cut of the Printer's Print Shop The good farmer; or, the entertaining history of Thomas Wiseman. Banbury [England]: J.G. Rusher, [ca. 1835]. 32mo (11.5 cm, 4.5"). ff. ; illus.  The aim of this Banbury-printed penny chapbook is to teach the rewards of virtue and industry; beyond the reaping of such serious satisfactions as solvency and respect, a wise and good poor boy may one day have a daughter plays a pretty spinet in a pretty dress and is called “Miss Fanny.” Illustrated with wood engravings on each page, this has additional illustrations on the wrappers: the first page (the recto of the frontispiece) has a cut of Rusher's printing shop. Searches of NUC, WorldCat, and COPAC locate only four libraries worldwide reporting ownership (Vassar, the V&A, the Bodleian, and the British Library). American History for Schools (1823) Goodrich, Charles Augustus. History of the United States of America. Hartford: Barber & Robinson, 1823. 12mo (18.6 cm, 7.4"). [10 (blank)], engr. half-title, [3 (1 blank)], 3–400, [10 (blank)] pp. ; 11 plts.  Third edition of this American school book by the Rev. Goodrich. The book is divided into 11 periods, “each distinguished by some particular characteristic . . . to aid the memory (p. 3–4).” In chronological order, the periods are distinguished for discoveries; settlements; the wars of King William, Queen Anne, and George II; French and Indian war; war of the Revolution; formation and establishment of the federal Constitution; Washington's administration; Adams' administration; Jefferson's administration; Madison's administration; and Monroe's administration. The work is illustrated with a total of 12 engravings, including portraits of the first five presidents and an engraved half-title page. Around the World with Maps & Costumes Goodrich, Samuel G. The second book of history, including the modern history of Europe, Africa, and Asia. Boston: Charles J. Hendee & G.W. Palmer and Co., 1838. 4to (19 cm, 7.5"). Frontis., 180 pp. ; 16 maps.  From the author of Peter Parley's Tales: a children's history reader aimed at pupils who had come a bit further along from that first book. The accounts here of the development of Great Britain, France, Spain, Portugal, Russia, China, etc., and the countries' foreign relations, are illustrated with in-text wood engravings including depictions of Portuguese, Norwegian, Russian, “Algerine,” “Otaheitan,” and other national costumes; also included in the volume are 16 steel-engraved maps. While the title-page gives the Boston publication line described above, the printed front cover gives Philadelphia: Thomas, Cowperthwait, & Co., 1838; this is a later edition, following the first of 1832. A first impression is that “child” readers had, in 1832, much greater powers of attention to print than is now common, but indeed the history here is — the stories are — absorbing and evocative. Limited Edition French Symbolist Essay Gourmont, Remy de. Le livret de l'imagier. Paris: Aux Éditions du “Sagittaire” chez Simon KRA, 1920. 16mo (16.5 cm; 6.5"). 49 pp. ; illus.  Essay from a French Symbolist poet with an introduction by Gabriel Albert Aurier (1865–92), printed on Holland paper in a limited edition of 950 copies, of which this is number 909. The little volume also offers a striking wood-engraved frontispiece in orange and black by Jean Gabriel Daragnès (1886–1950) who additionally provided the wood-engraved headpieces, and the colophon notes the item was printed by Ducros, Lefèvre, & Colas. “March, March Away! To the Playground Lead the Way” Greenaway, Kate, & Myles Birket Foster. A day in a child's life. London: George Routledge & Sons (pr. by Edmund Evans), . 4to (24.9 cm, 9.55"). 29,  pp. ; col. illus.  First edition of this book of music themed around the innocent goings-on of a child's daily life, lovingly rendered by the celebrated Victorian illustrator Kate Greenaway. Each engraving depicts a child in an idyllic world devoid of political or class struggles and surrounded by the most beautiful aspects of nature and life — as was common for Greenaway's work. The pretty frontispiece depicting a mother and her two babes, as well as the delicately decorated title-page (preceded by three preliminary illustrations and a decorated half-title) instantly evoke the ideal world Greenaway imagined for children. Edmund Evans (1826–1905), an English wood engraver and Greenaway's frequent collaborator, engraved and color-printed the quaint illustrations. During the height of their partnership, Evans worked with Greenaway on two to three books a year; their career-long association was highly beneficial for them both. The nine songs here enhanced by their joint work were written by Myles B. Foster (1851–1922), son of the prominent English illustrator and engraver of the same name. Each song includes melody, lyrics, and piano accompaniment. “Why, All the Cats Had Come to Tea” Greenaway, Kate. Marigold garden. Pictures and rhymes. London: George Routledge & Sons, . 4to (27.9 cm, 10.9"). 60 pp. ; col. illus. Provenance: Half-title with inked inscription reading “Ruth Allison [/] March 14th 1889,” and pencilled purchase notation (giving a price of 49¢). Later in the children's book collection of Albert A. Howard, small booklabel (“AHA”) at rear. The Beginning of the Greenaway Vogue Greenaway, Kate. Under the window. Pictures & rhymes for children. London: George Routledge & Sons, . 8vo (24.1 cm, 9.5"). 64,  pp. ; col. illus.  Kate Greenaway's first book, and one of only two for which she provided both text and illustrations: a best-selling introduction to her inimitable, sweetly sentimental style. This is the first edition, here in a later issue, with the printer's ornaments on either side of Evans' name on the title-page. POPULAR PICTORIAL LATIN Greenwood, James. The London vocabulary, English and Latin: Put into a new method, proper to acquaint the learner with things as well as pure Latin words. London: R. Baldwin, F. & C. Rivington, G. Robinson, et al., 1807. 12mo (14 cm, 5.5"). viii, 123,  pp. ; illus.  A schoolmaster at St. Paul's School, London, compiled this popular Latin–English dictionary, divided into topic-based chapters. Each chapter opens with a wood-engraved illustration incorporating examples of the types of object covered in that chapter: animals, insects, minerals, foods, body parts, diseases (illustrated with a sickbed scene), etc. The work was inspired by and based on Comenius's Orbis Pictura, and seems to have enjoyed almost as much success in English schools; while the date of the first edition is unidentified, the third edition appeared in 1713, with this present example being the 23rd edition according to the title-page. Provenance: Front pastedown with inked ownership inscription “W. & B. Edwards. Feb.y 5th 1816.” Most recently in the children's book collection of Albert A. Howard, small booklabel (“AHA”) at rear. A Costume Designer's Interpretation of Gogol Gregory, Anne. [Costume illustration for] The government inspector by Nikolay Gogol. [U.S.]: ca. 1971. (27 cm, 10.65"). 24 col. illus.  A remarkable album: 24 panels of hand-inked and painted costume designs for a production of Gogol's Government Inspector (a.k.a. The Inspector General, originally Revizor). These delightful designs, slightly reminiscent in style of Jean de Brunhoff's illustrations, convey a great deal of personality; each panel's character is shown in a different pose — including those characters given more than one costume — with a range of expressions portrayed throughout. The images were painted on heavy panels bound together with cloth tape leporello- or accordion-style, with the entire sequence unfolding as one very long, very impressive strip ABOUT 20 FEET LONG. Following Anne Gregory's name on the cover here is the designation, “'71,” but its significance has not been established. There was a premiere of Zador's revised operatic version of The Government Inspector at El Camino College in that year, and these do look like they could be operatic costumes; so perhaps the date refers to that production — or, perhaps “Anne Gregory” was to graduate from that institution or another, that year.